Our mission is simple: To provide for all your culinary and wellness needs. We love what we do. We think you will too. The table is a place for family, good friends, and good food. Whether it's a chocolate shake or a five course meal, we take pride in the food we serve and the friends we make. Always fresh. Always delicious. Whether you love chicken, hate fish, or are gluten-free, your menu is specially designed to suit your dietary needs and culinary desires. Whatever you want. We can make it. "Helping you and your family eat healthy." Hi! 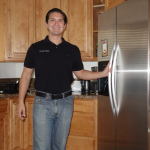 My name is Mark Mahin and I’m a personal chef, a wellness advisor, and the owner of Food Valet. My clients love the services I provide, and I think you will too. But don’t take my word for it, take theirs. Read my testimonials and sample menus to get an idea of what Food Valet can do for you. And if you don’t see something you want, or just want to ask some questions, please feel free to email me. I’d love to be your Food Valet. Don’t see something? Just ask! My husband and I have been using Mark’s services with Food Valet since January 2014 when I was newly pregnant with our daughter. We were looking for someone who could prepare healthy, organic, and nutritious meals for our growing family. Mark was our solution! Mark was thoughtful in his approach and his easygoing demeanor made it simple to communicate our needs and get them met. We highly recommend Mark and Food Valet!